Master microscale landscaper Full Plate brings us another lovely LEGO scene that captures the moment on a roadtrip when he finally reached rolling hills and winding roads instead of the boring plains he’d been driving on. I often feel the same way when returning to the green of western Washington State from the barren wastelands east of the Cascade Mountains. 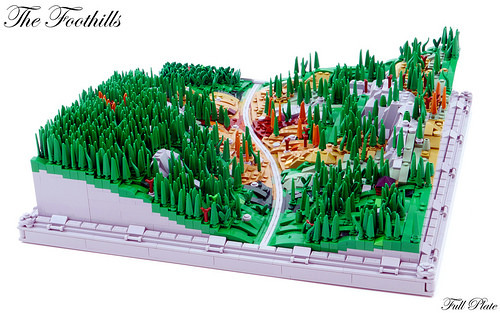 While many of the builder’s previous microscale masterpieces have featured a wide variety of trees, this build is at a smaller scale, and uses varying heights in the underlying terrain to add variety to the forest of evergreens.